A critic’s personal feelings or attachment to a subject are often irrelevant when it comes to writing about a particular play. But in the case of Berkeley Repertory Theatre’s world premiere of X’x and O’s (A Football Love Story), I feel I have to disclose a strong personal bias. I loathe football. LOATHE it, and have all my life. That’s my dad and my brother’s territory. I’ll be in my room canoodling with stereotypes and listening to Broadway cast albums. Sports in general have never interested me much, but no other sporting activity do I actively detest and strenuously ignore as much as loud, violent, overblown football. Football, unlike, say, politics or current events, is something I can choose not to engage in – it’s a form of entertainment, albeit a behemoth of a form, and I can opt to spend my time, energy and enthusiasm elsewhere. Sometimes, as of late, the goings-on in the NFL are hard to ignore, but when it comes to sitting in a theater and watching a play about football, specifically one describe in its subtitle as “love story,” I wrestled a bit with whether to show up. I will say this about X’s and O’s: I’m glad I showed up. The 80-minute documentary drama based on interviews with former players, their family members, fans, physicians and others held my begrudging interest, so credit to KJ Sanchez, who wrote the piece with Jenny Mercein, who is also in the cast. Also credit director Tony Taccone with providing just enough flash with the stadium lights and the near-constant video projections to balance with the generally strong performances from his energetic cast of six, which includes former 49er safety (I don’t know what that is) Dwight Hicks, who helped that team to two Super Bowl victories in 1982 and 1985. Testing the theory that anything examined from multiple perspectives will reveal drama, Sanchez and Mercein quickly expose the conflict at the heart of America’s love affair with football: fans love the game and all that comes with it – the bonding, the drinking, the shouting and, perhaps most of all, the brutish bashing of man-on-man action – but all of that comes with a very human price in the form of significant, life-altering injuries suffered by the players and, consequently, by their families. The writers try very hard to balance their presentation. Fans are able to express why they love the game and why it can be a challenging sport to love. The former players, even the ones with significant injuries, express everything from pride to regret about their time on the field. 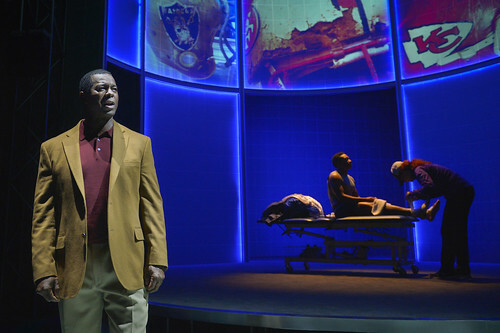 But from my already anti-football seat, I was struck most by how the accumulated personal stories, especially the trio of family members (Mercein, Eddie Ray Jackson and Marilee Talkington) toward the play’s end that expresses the agonizing effect of a degenerative brain injury known as CTE (chronic traumatic encephalopathy), underscored my feeling that a form of entertainment – even one that makes billions of dollars – is not worth the serious injury of those who choose to participate in it. That X’s and O’s asks us to seriously consider the duality of football – its value, its cost, its cultural relevance – is a significant matter. For all the zippy fun in the play – and there’s plenty – this is a play that says loving something blindly or madly is ultimately irresponsible if you’re not also considering the bigger picture. Of course there’s always football as a microcosm of the United States, and certainly issues of race and class come up here, but only glancingly. This is not a play that will change anybody’s mind: the lovers will love and the haters will hate. But it is a play that makes you think, and you’re likely to leave knowing more about brain injuries than you did when you went in. This is a deep, rich topic, and maybe there’s a bigger, deeper football play to come. Or better yet, maybe a musical. 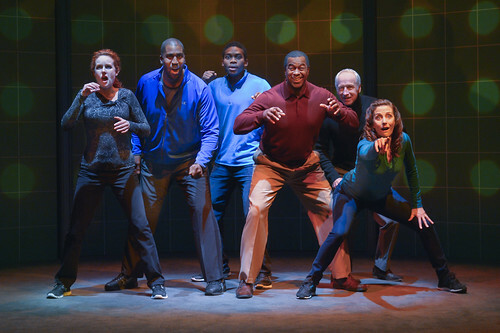 X’s and O’s (A Football Love Story) continues through March 1 on Berkeley Repertory Theatre’s Thrust Stage, 2025 Addison St., Berkeley. Tickets are $29-$79. Call 510-647-2949 or visit www.berkeleyrep.org. Any word on this production? Spot on review X’s and O’s.